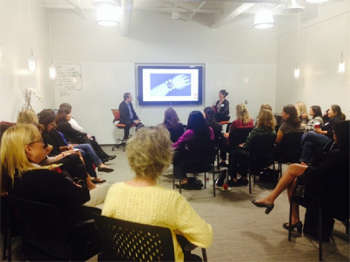 Starting off the Orange County WITI evening, speaker Dave Whelan, CMO of STEMP, asked 'Who is wearing a Wearable?' Only 3 hands were raised out of a group of 50. You may not believe it, but wearables have been around a long time. Maxwell Smart*, Michael Knight*, and George Jetson* all had a wearable long before today's consumer. Dave and special guest Mitra Hooshmand, CEO of ScientiFIT, lead our holiday Mix and Mingle with a lively discussion espousing wearable expectations... and of course, for a woman, it needs to be fashionable and not manly bulky. So what exactly is a 'technology wearable'? It's computerized technology involving hardware, software, wireless communications, and services that does more than a wristwatch; it's something that a person can accessorize with; and most importantly, use daily. Most notable wearable today is Fitbit's wristbands to monitor your activity, sleep, and/or heart rate. Other wearables on the market also sync with your smartphone to alert you to emails and notifications so you never miss a message again. The biggest challenge for wearables is... will you be wearing your wearable in 6 months? Are wearables just a fad? We are on the cusp of wearables either falling to the wayside or doing wonderful things to enhance our daily lives. How would you like it if your wearable could unlock your front door (instead of using a key)? Wave your wearable and instantly pay for a cup of coffee at Starbucks? Provide health notifications to your doctor instantly? Provide biometric feedback based on your body sensors? How about an automobile wearable to control our road rage? The true benefit will come once we can harness all the information that wearables collect and can change our behavior. Rounding out our evening during our Mix and Mingle, we had hand-on demonstrations from five vendors sharing their latest in wearables. Ali Mazaheri, Microsoft's Technology Architect, demoed the new Microsoft Band that just came out on the market. Not only is it an activity tracker, it is an alerting system, pays for my Starbucks drink, and has a broad ecosystem interacting with either an Android, iPhone, or Microsoft smartphone. We were able to see the Microsoft Band in action with each smartphone. 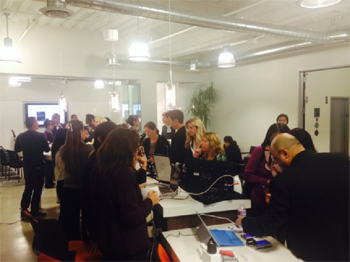 Along with Microsoft, we showcased local Orange County talent with three of the startup companies being led by women. Their curriculum vitae is impressive with Electrical Engineering or Biomedical Engineering undergraduate degrees (along with a MBA or PhD). We got to mix and mingle with these ladies as well as see their products in action. A sneak peak of their products is listed below as we promote Women in Technology. www.fashionteq.com is a Ladera Ranch startup lead by Judy Tomlinson, CEO. The first real-time smart jewelry (fashionable wearable) as either a ring, bracket or pendant. You can modify the display image, receive alerts from your smartphone (iPhone and Android), and/or integrate with Facebook. We are excited that Fashion finally meets Hardware. ahundredtinyhands.org is a University of California, Irvine startup lead by Jolie McLane, CEO. Focusing on promoting STEM, they make inventor kits for kids to learn about hydro tension, circuits/electricity, or optical lenses to be placed on cell phones. Start your kids exploring science early. It is Science at Play. uvicube.com is an Irvine startup founded by Autumn Colayco. UviCube uses (ultraviolet) UV light to eliminate 99.9% of germs from baby bottles and disinfects electronics. Autumn's first child spent two weeks in NICU for an infection. She and her husband built a product that meets all US Federal and Local safety and compliance standards for the modern parent. It is an ultra-cool germ killer. getstemp.com - Called the Smart TEMperature Patch - this startup (where our speaker Dave is the CMO) plans to launch a wearable that is an intelligent body thermometer providing continuous body temperature monitoring connected to your iPhone. Alerts are configurable. Truly amazing for peace of mind. Place a patch on your sick child and your cellphone by your bed. Monitor your child's fever continuously during the night. It is a Band-Aid integrated with Hardware and Software. On a larger scale, this startup is looking to pilot STEMP in world health with deployment in Africa for Ebola. Not to be outdone by technology, a special call out to Robin Beesco who offered the more traditional jewelry displaying Stella Jewelry for holiday shopping. Orange County WITI wishes you a Happy Holiday. Be a geek and show off your fashionable wearable this holiday season. '*' Maxwell Smart and Michael Knight are 1960s and 1980s TV characters respectively. George Jetson is a cartoon character.